The micro:bit micro-controller that is the "brain" of the MakerBit has a program that runs on it, which can operate without a computer attached, and in that mode, touching any touchpoint lights up an LED. When connected to a computer with the USB cable, the MakerBit Media Linker app then can interact with the MakerBit hardware, and touching the touch sensors will not light up corresponding LEDs unless directed to by the Media List controls for Arriving at Media and End of Media. The MakerBit program is also compatible with other applications running on a computer that can operate with an Arduino, such as HyperStudio, Snap4Arduino, Firmata Test and others. 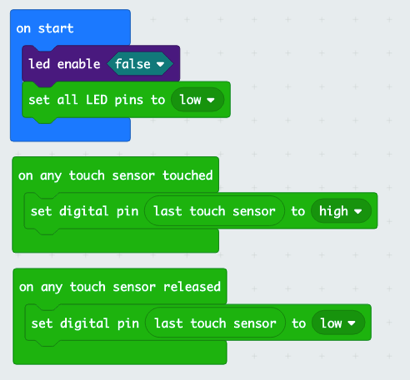 Most MakerBit interactive projects will use the MakerBit program installed on the micro:bit at the beginning of the MakerBit Tutorial, or re-installed if you've uploaded your own custom programs to the micro:bit, but then later want to return to normal MakerBit functionality. However, the program above would only be sufficient to turn on and off LEDs with touch sensors. It wouldn't be able to play audio tracks from an mp3 player, display touch sensors or analog values on an LCD display, or communicate directly with the MakerBit Media Linker so as to be able to link videos and other digital media to a diorama or posterboard project. All those functions combined are what the MakerBit Program does when installed on the micro:bit with the MakerBit attached. To install the MakerBit program, click on the MakerBit program image in the Programs gallery to download the file. Then move it from your downloads folder to your connected micro:bit directory. The micro:bit will restart, and it will then be ready to interact with the MakerBit Media Linker.